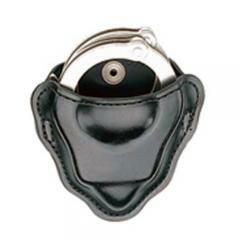 Forget about the possibility of losing restraints when using the U79 Leather Duty Form-Fit Handcuff Case from DeSantis. The essential accessory is precision-molded to fit Smith and Wesson Model 100 handcuffs (as well as similar chain-style cuffs) like a glove, holding them securely in place through all the rigors of on duty wear. The case attaches with a simple snap closure in the rear and includes a convenient strap that allows for removal of the case without taking off the duty belt. DeSantis' high-quality item is crafted from full-grain leather and accommodates belts up to 2.25-inches wide.